$22,100 paid in full before you start your first day of training! If you want to fly for United Airlines, CommutAir can get you there the fastest! Our planned growth means career progression for our pilots. Captain pay for all pilots no later than one year after completion of training. Year One earn $74,000, Two-Year cumulative $140,000. Do you have 121 time? Expect a rapid call to upgrade. Not excited about Reserve? We have short Reserve times in all bases. Not ready yet for upgrade? First Officers can expect to get >1,000 hours of flight time within 18-24 months. Captain Pay - one year after completing training. Continue receiving Captain pay until you upgrade to Captain. Captain Retention Bonus payments after upgrade. Pay and bonus remain in place unless you bypass upgrade or do not complete training. Up To $2,500 Referral Bonus - Paid to any CommutAir employee who recommends a pilot candidate who interviews or begins new hire Pilot Training. Electronic Flight Bag (EFB) - Company supplied iPad for use as EFB offers pilots a digitized interface for navigational charts, aircraft checklists, and other aircraft/operating manuals. Industry Leading Commuter Benefits - Skip crash pads with CommutAir right after Reserve. 4 company-paid hotel rooms per month to all registered commuter pilots in addition to our unlimited “make a good faith effort to get to work” commuter policy. Preferential Bidding System - CommutAir uses NavBlue for crew bidding so you can customize your bid per your individual needs, based on your seniority. No-Cost ATP/CTP Course – If you need it, we will pay for it - travel, lodging, course fee and FAA exam fee. EWR and IAD – Our crew bases are at United hubs – one hop away from most airports. Regardless of your skill level or experience, CommutAir has a program for you. 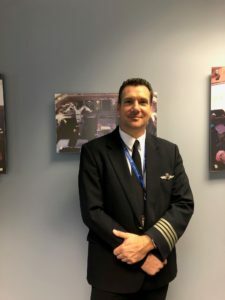 Learn about our various pilot programs by listening to Carl Valeri’s Aviation Careers Podcast which features our Sr. Manager of Corp Comm – Joey Dhaliwal. You can access the podcast via the link below. Instrument current- logged 20 hours of flight time in the past six months, 25 hours of multi-engine fixed wing experience- actual flight time not sim. Will be able to credit additional required hours in CommutAir training.